My paintings on stretched silk explore the nature and fragility of the superficial layer. Using silk organza as my canvas, the paintings present the surface for what it is, a dubious facade wrought with hidden elements. Each work reveals its infrastructure, conceding how it was made. I use sculptural elements in the paintings paying particular attention to how space is inhabited. Time is slowed with every stitch of thread and the accumulation of paint layers on the silk. The opaqueness of these built up shapes plays off the translucency of the silk, casting shadows that become a part of the painting. The thread lends a subtle character to the work that requires the viewer to come close. I intentionally leave the thread ends trailing inside of the painting, occupying that void. 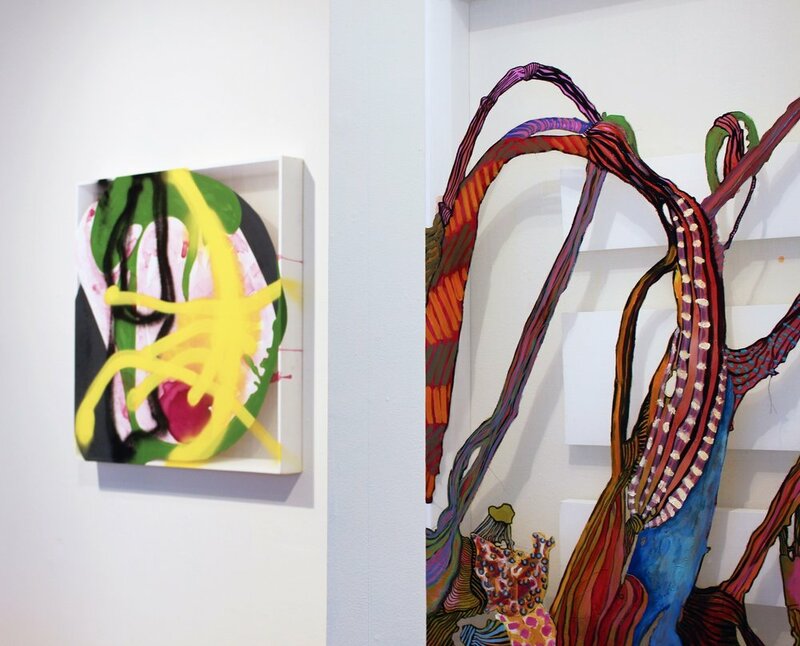 I want these paintings to transcend their two dimensional canvas and encourage the viewer to look beyond the surface. I wanted to make paintings that explore the painted canvas in a three dimensional way. By combining elements that oppose each other, the paintings reveal more of themselves as you get closer to them. Large wood structures installed within the canvas are juxtaposed with intricate stitching and loose thread. Geometric shapes are offset by more organic forms. Transparent silk material plays against the solidity of the painted forms. Oil, Acrylic, Flashe, Embroidered Thread on Silk over Wood with Recessed Wood Structures. The confined nature of the square or rectangular painting surface is an opportunity to test the boundaries of painting and how a painting can be experienced. For these works, much time is taken to prepare the canvases. I carefully stretch silk organza over wood stretcher bars. After drawing my shapes onto the “canvas”, I begin the task of stitching the shapes into the silk. Then, layer upon layer of paint is applied making the silk surface impenetrable in certain areas. I am constantly playing with the balance between positive and negative space on the canvas. It is the “empty” spaces where other elements (light, shadow, wood structures) are able to have an impact. Time slows down with every stitch of thread and the accumulation of paint layers on the silk. I have learned over time what this surface can handle and enjoy testing those limits with each work. Using silk as a stretched painting surface enables me to explore the nature and fragility of the superficial layer. The paintings present the surface for what it is, a dubious facade wrought with hidden elements. Each work reveals its infrastructure, conceding how it was made. Oil, Acrylic, Flashe, Embroidered Thread on Silk over Wood with Recessed Wood Structure. Consume Me and The $&% Went Down! By using silk as my painting surface, light and shadow become part of the work. The opaqueness of the built up shapes plays off the translucency of the silk, casting shadows that become a part of the painting. When I am outside, light and shadow always play a part of the way a landscape is experienced. For these paintings, I try to incorporate that feeling into the work. I want these paintings to transcend their two dimensional plane while encouraging, you to look beyond the surface. As with all of my work, nature and the shapes, crevices and oddities found there impact how and why I make these paintings. I spend a lot of time outside, hiking, kayaking, photographing, filming and drawing. With these paintings, I am trying to get to the most essential elements of a space as I have experienced it. Nature, my greatest teacher, has shown me that the quietly bold endures and insight is found through collaborative contrast. Visual art is everyone’s language. In these four paintings, multiple patterns, systems and painting methods are combined into one unified painting. Here, I was thinking a lot about the current political and cultural climate. The language of art is a cultural unifier and I wanted push that a bit here. Here are some detail images of select paintings that enable you to see the stitching, dimensionality and shadows in the work. Click on the image to see the full piece and where to purchase it.